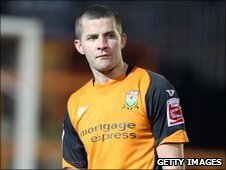 Exeter City have signed Irish striker John O'Flynn on a free transfer following his departure from Barnet. The 28-year-old, who netted 15 goals for the Bees last term, joins City after nearly two years at Underhill. O'Flynn, who began his career with Cork City, had been on trial with Championship side Bristol City, but was not offered a deal. The striker told the club's official website: "I aim to play as many games as I can, and the goals will come." He added: "I am delighted to be here. It is a great club and one that is held in very high regard. "I have had some great feedback from those that have played here before and I am really looking forward to League One."